Quick, fill in the blank. The countryside in southern Spain is _______. What landscape would you expect to see? On our recent cruise around Spain I took a shore excursion to a village in the foothills of the mountains of Andalusia. This is the original Sierra Nevada (snowy ridge) for which our mountain range is named. We did not see snow on the mountains as did the travelers who went to Granada. But a few of the people on my bus said what I was thinking, that the region reminded them of our southwestern states of Colorado and New Mexico. 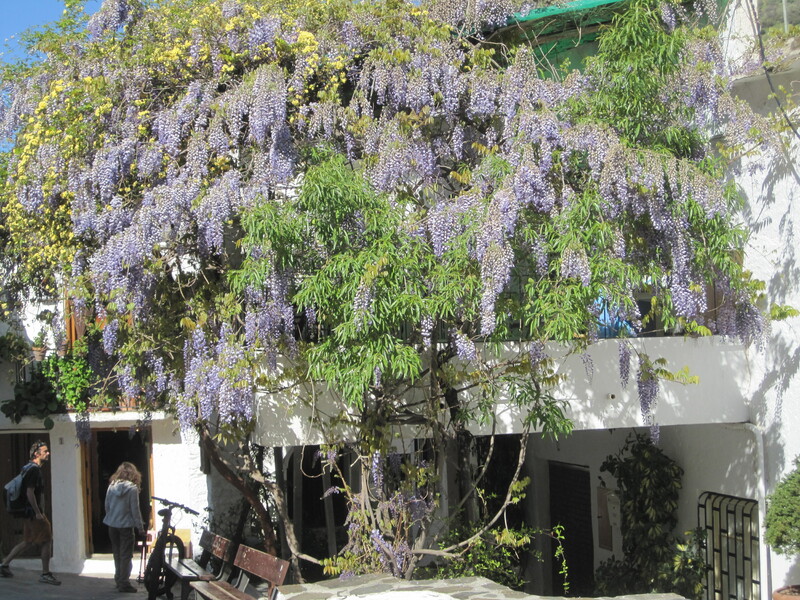 The region is called Alpujarras; the whitewashed houses and narrow streets are very picturesque. Their home designs have been perfected over centuries, adapting the Moorish flat roof design to take advantage of the insulating properties of snow. Chimneys are tall enough to vent above the top of several inches of snow. Our April visit gave us no snow, just wonderful wisteria and other blooming shrubs. What we did not expect on the outing was to see row upon row of gourmet hams curing. 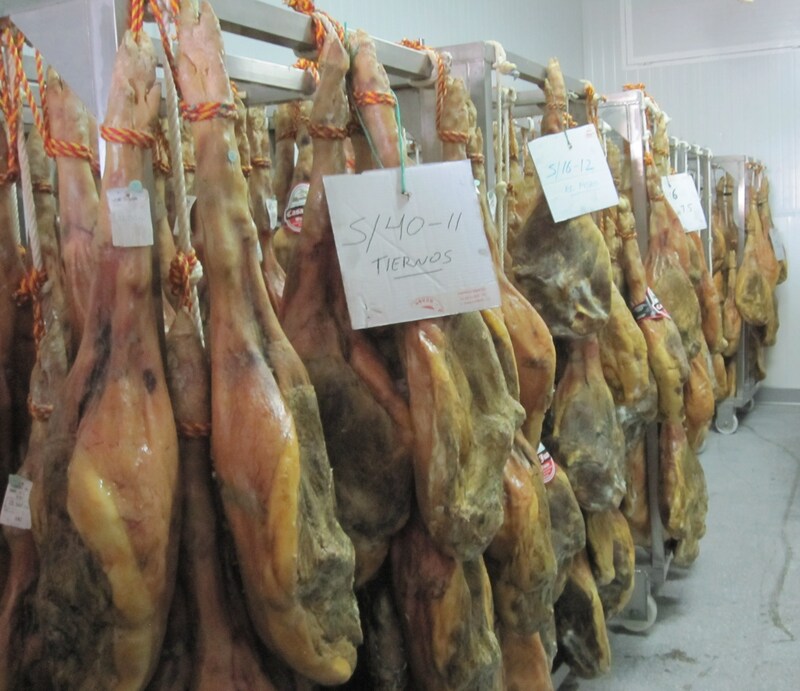 This unadvertised stop on the trip took us to a curing facility for Jamón serrano (mountain ham). These hams are cured with salt for a few days and then hung to dry in cool air for several months. What we saw was not quite the delicacy (Jamón Ibérico) you might have seen on Rick Steves’ show about Spain, or cooking shows with the likes of Mario Batali. The distinctive flavor of various Spanish hams comes from the breed of hogs and their diet; the most prized variety, Iberian ham, comes from black footed hogs that ate mostly acorns or olives. This is part of one of the rooms filled with mountain ham. The plant we visited receives the hog legs already trimmed. They soak them in brine for a few days and then hang them to cure. Periodically they rub a salve on the cut section of the ham (where the leg connected to the rest of the animal) to protect against mold, but otherwise the only treatment is occasional rotation for ventilation. The building stays cool with natural ventilation by mountain air, windows open at night and closed in the morning. This low-temperature curing method — though it is traditional — is not widely accepted in current food prep authorities. Importing Spanish ham to the US is seriously restricted. The most surprising thing about the place was the sheer number of hams hanging in each room. It was not a “factory” by any stretch of imagination, but we were all amazed at the number and value of the legs hanging on the swinging racks. It was a much more visceral impression than viewing a room full of sherry casks, regardless of the vintage! We were served the usual very thin slices of mountain ham at the end of the tour. It tastes rather like prosciutto. The next time I see ultra-thin slices of ham, I will remember the curing rooms with racks and racks of legs just hanging there, awaiting their day of glory at the table! Here I am, surrounded by (other) hams. 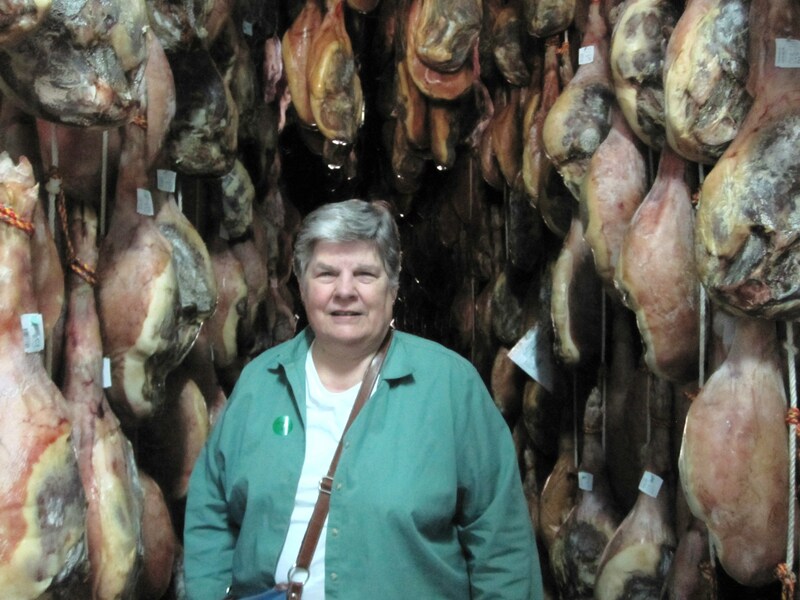 This entry was posted in Travel, Uncategorized and tagged Alpujarras, Andalusia, jamon iberico, Jamon Serrano, Rick Steves, Spain, travel. Bookmark the permalink.